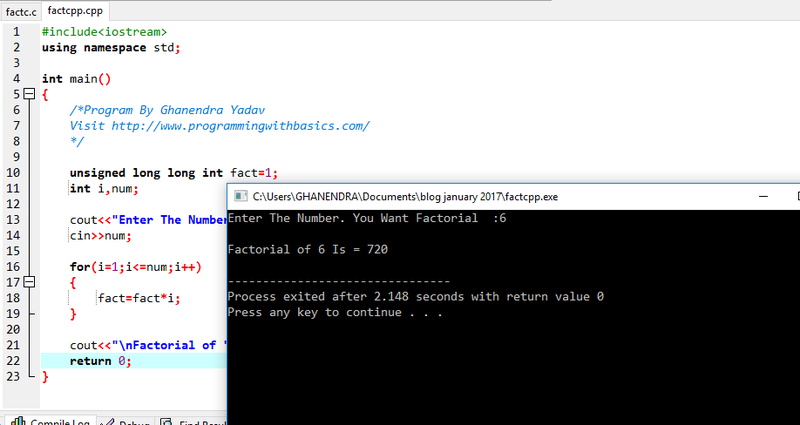 Problem:- Write A C++ Program To Calculate Factorial Of A Given Number or factorial program in c or Factorial For Large Number Using Array. The factorial operation is encountered in many areas of mathematics, notably in combinatorics, algebra, and mathematical analysis. Its most basic occurrence is the fact that there are n!. This fact was known at least as early as the 12th century, to Indian scholars. Logic:- Suppose we want to find factorial of number 6 then we can multiply number from 1 to 6 (n) like 1 * 2 * 3 * 4 * 5 * 6 = 720. 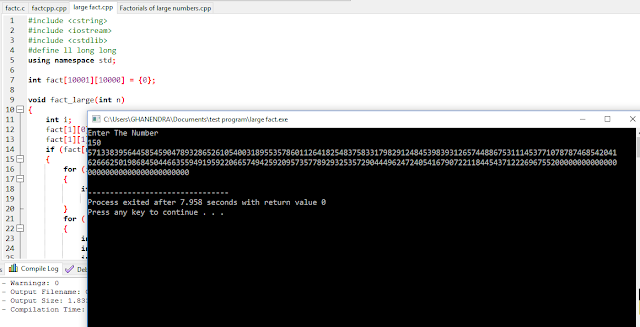 So we can use a loop and run the loop from 1 to number n (the number whose factorial you want) and multiply a number, this is a simple way to find a factorial. You can also find the factorial program for Large Number.